Sherry—isn't that something they drink on Downton Abbey? For many of us, sherry sounds like a drink of the past, best left in its dusty bottles. But give the misunderstood drink a chance. These Spanish wines are not only fascinating in cocktails and complex in their own right, but also food-friendly and mixing-friendly. Their styles are all over the map, from crisp fino to nutty amontillado to dessert-like Pedro Ximenez. We'll leave all the technical definitions of sherry for another time, but know this: Fino sherry is the lightest, driest, and easiest to drink. White wine fans will love it. And given its complexity and bright acidity, it's easy to use in cocktails. 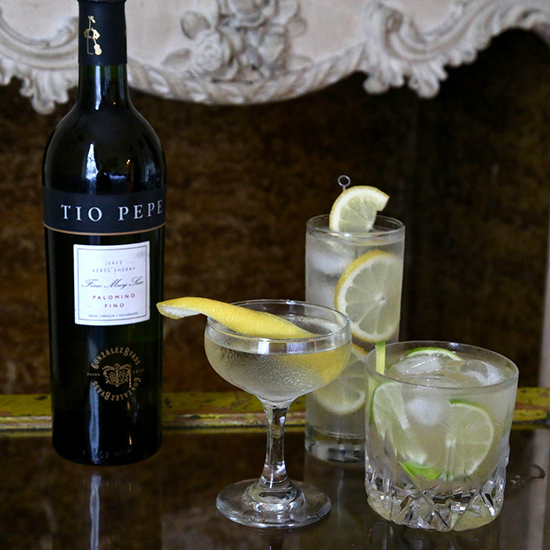 Here, we're using the classic Tio Pepe, the sherry world's most popular fino; most sizable wine stores should have it. Pick up a bottle and try these three simple and crazy-refreshing summer cocktails. It gets hot in the south of Spain—sherry's birthplace—and you'll find there's nothing better than fino sherry to cool you down. Sherry works beautifully in martinis, taking the place of vermouth, but its flavor is less aggressive so it can be more of an equal partner, and less of a supporting player. Here, instead of using vodka or gin (though both would work nicely), we're pairing the sherry with a high-quality dry white rum (we like Brugal Extra Dry), which lends it additional body. Give it a stir and see if your martini loyalties don't shift toward sherry. Instructions: In a mixing glass with ice, combine two ounces dry white rum, 3/4 ounce of fino sherry, and a quarter-ounce of simple syrup. Dash in orange bitters if you have them. Stir all that together for about 30 seconds, until your ice begins to melt. Strain into a martini glass and garnish with a lemon peel, squeezing it over the drink first to release the citrus oils. If there's a more refreshing cocktail out there, we haven't found it. A Tom Collins pairs gin with lemon, soda, and a little simple syrup; here, we're adding in sherry for a drink that's a little more sophisticated and beautifully balanced. We'll give you a recipe for one drink, but feel free to make it by the pitcher and watch it disappear. Instructions: In a shaker with ice, combine an ounce of London dry gin (like Beefeater or, even better here, Beefeater 24), an ounce of fino, half an ounce of fresh lemon juice, and a quarter-ounce simple syrup. Shake that all up together hard, then strain into a tall glass over fresh ice. Top with 2 ounces of club soda and garnish with lemon wheels. Tequila meets fino sherry in this unlikely-sounding but irresistible cocktail. The fino sherry in this margarita variation lengthens the drink and tones down the citrus and tequila a bit, while keeping up the acidity. This is our drink of choice 'til the fall. Instructions: In a shaker with ice, combine an ounce of silver tequila, an ounce of fino sherry, 3/4 ounce of fresh grapefruit juice, 1/2 ounce of fresh lime, and a quarter-ounce agave syrup: equal parts agave and hot water. (If agave you can't find agave, simple syrup will work too.) Add a dash of orange bitters if you have them. Shake that all up, strain over fresh ice, and garnish with a lime wedge.